This question prompted by discussion regarding this answer to a question about vegetarianism. I recently came across a U.N. review of studies seeking to determine the earth's maximum sustainable human population: "One Planet, How Many People? A Review of Earth’s Carrying Capacity". 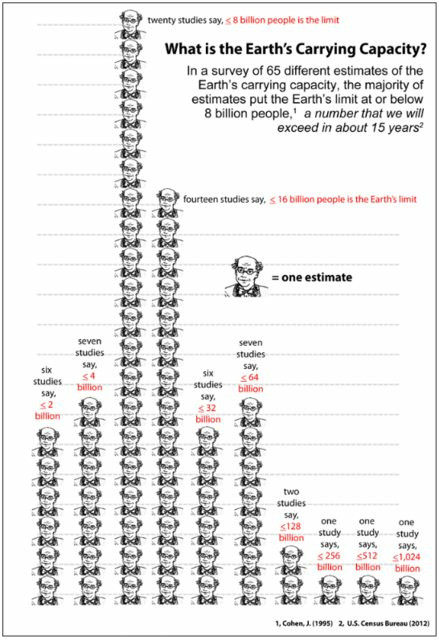 Conveniently, most studies put the limit at 8 billion, a number just below the present population. In the six years since this review, has a more robust, consensus-driven method been developed to determine the limit? What limit has been determined? I'm interested both in the estimate itself, and a discussion of how the methodology used to make the estimate has improved over time. This formula describes the impact of human activity on the environment as the product of three factors: Population, Affluence, and Technology. If you made assumptions for all of these factors and their dependencies and interactions, as well as unspecified behaviors (e.g., diet) then one could make a rough estimate of the carrying capacity of the Earth. Not the answer you're looking for? Browse other questions tagged environmental-impact ecological-footprint population or ask your own question.